A word. A link. An icon. The Google domain first went online in 1997, primarily operating as a search engine; and now, it seems as though Google is exploring new avenues – delving into innovative information services, hardware and gadgetry ventures alike. The search engine and number 1 ranked site in the world. One could easily see why, Google offers unreserved access to over a trillion pages and thus an ever-growing source of organized linked information which is made useful through Search Engine Optimization technology. A few of the many services on offer which have become an integral part in the manner in which we store and share information to the people around us and the world at large. This is Google‘s attempt at becoming an internet service provider, promising “a connection speed 100 times faster than today’s broadband”. Although Google Fiber is still brand new, currently piloting in compatible cities in the U.S.A., it aims to revolutionize the industry. Essentially a wearable computer resembling an ordinary pair of glasses, it’s a smartphone-esque gadget with which users can search for information online, text and take photos and videos. Google Glass is voice-activated and totally finger-tapping free. Innovative applications that will manage, organize and present information you need when you need it; making everyday telecommunication more manageable. To be frank, we live in the Google era. Yes they provide seemingly essential services and so live up to their mission statement, having organized the world’s information making it universally accessible and useful; so what would life be like without them? Google Has Some Exciting Projects In The Pipeline – Seeking Alpha. 21 April 2013. Accessed 24 April 2013. Available at: http://seekingalpha.com/article/1356911-google-has-some-exciting-projects-in-the-pipeline. Facebook and Twitter key to Arab Spring uprisings: report – Carol Huang. 6 June 2011. Accessed 25 April 2013. Available at: http://www.thenational.ae/news/uae-news/facebook-and-twitter-key-to-arab-spring-uprisings-report. 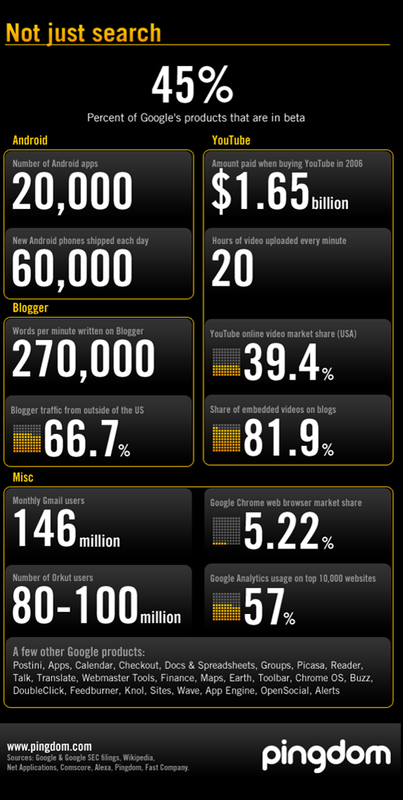 50 Amazing Google Facts and Figures – Hamza Hasnain. 8 April 2013. Accessed 23 April 2013. Available at: http://gpaf.blogspot.com/2013/04/50-amazing-google-facts-and-figures.html. Google’s Fiber takeover plan expands, will kill cable and carriers – Jason Calacanis. PandoDaily. 19 April 2013. Accessed 01 May 2013. Available at: http://pandodaily.com/2013/04/19/googles-fiber-takeover-plan-expands-will-kill-cable-and-carriers/. Google Glass review – Engadget. YouTube. 30 April 2013. Accessed 01 May 2013. Google Now Homepage – Google. Accessed 1 May 2013. Google Voice Features – Google. Accessed 1 May 2013. Tags: Google, Google Fiber, Google Glass, Search Engine Optimization, Search Engines, YouTube. Bookmark the permalink. this kind of stuff! Time to learn *about all of it*.